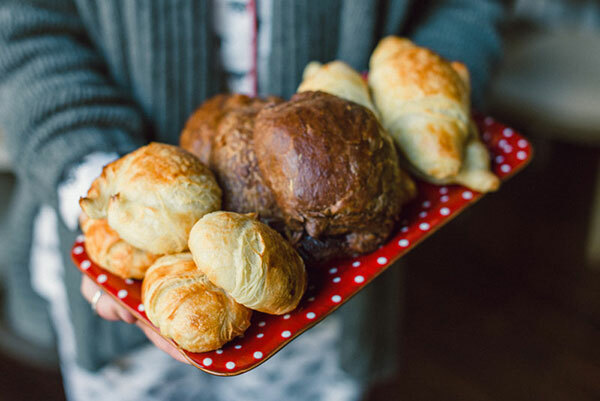 One of my absolute favorite holiday traditions is my family’s Christmas Day brunch. 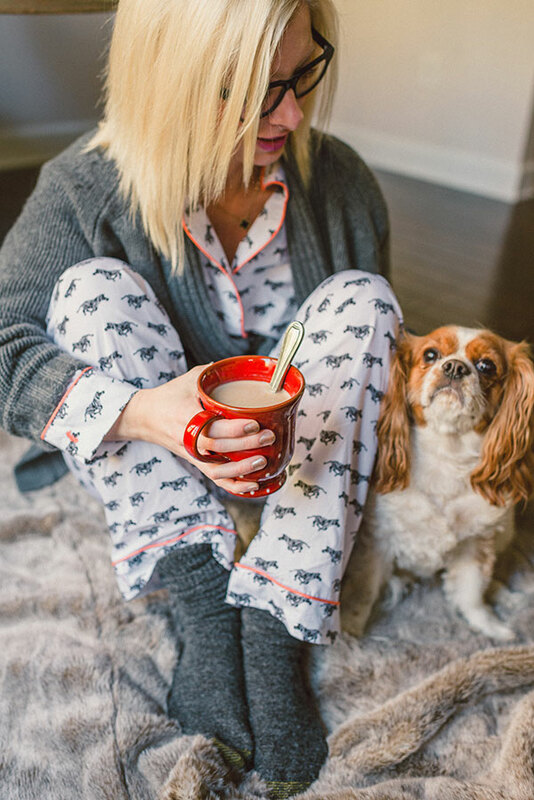 Right after the presents have been opened, but before we settle in for the inevitable mid day nap we gather together, pajamas still on, and brunch. And this year will be extra special because I’ve had a little help from VIETRI. 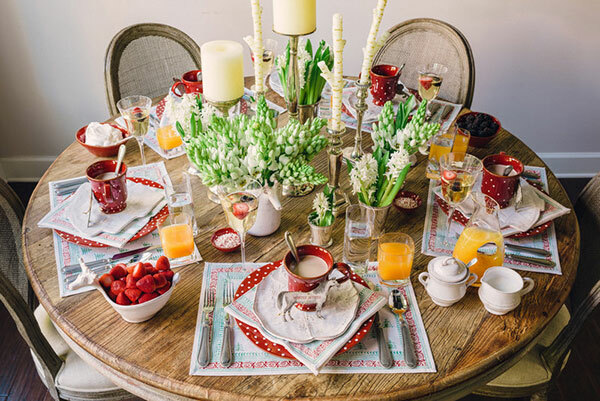 For over 30 years VIETRI has been bringing handcrafted tableware and decor straight from Italy and in to our homes. And this year I fell in major love with their Rosso Vecchio Dot collection. The Rosso red is the perfect red, which means it can translate well past the Christmas season (think Fourth of July and summer BBQ’s), and pairs perfectly with their classic Bellezza Holiday accent plates and reindeer bowls. 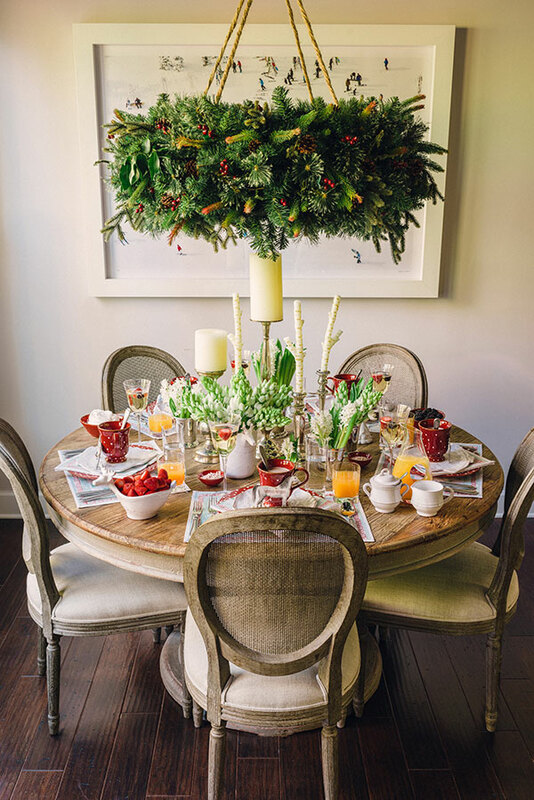 I completed the table with VIETRI’s classic pewter flatware, my favorite linens from the Shop, and more food than any one family can eat and voila. The table couldn’t get any more festive. P.S. Big, big congrats to Ellie the winner of our Studio Ten 25 giveaway. This post was sponsored by VIETRI, however my opinion and love of VIETRI brand is 100% my own. The legal mumbo jumbo...this giveaway is open to US and Canadian residents and will run through Sunday the 8th with our winner announced Monday the 9th. We’ll be running this all through Rafflecopter (below) which allows you to earn points for each item completed with a simple click of the button. The more points you earn the more likely you are to win (and remember you probably already have entry points if you’re a regular reader of the blog). 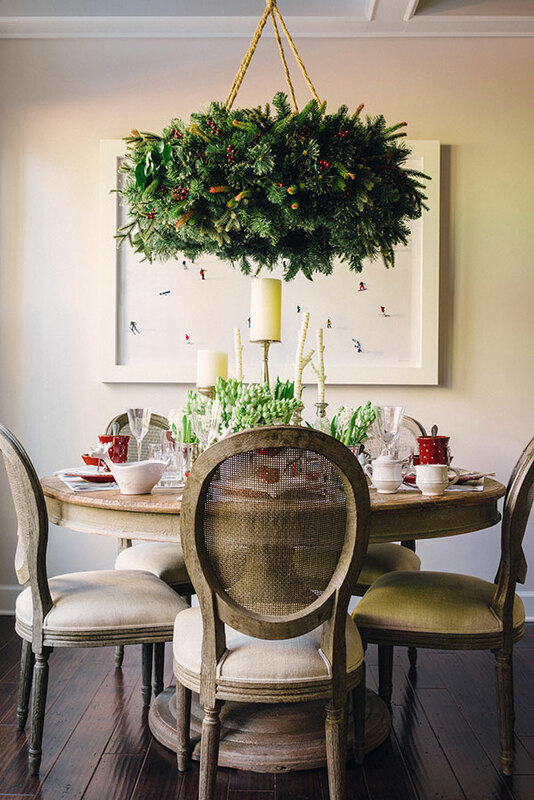 Loving all of this great Christmas inspiration! We’re hosting brunch at our house this year, so this post was perfect! Love everything Vietri, especially Christmas Vietri! Would love those Canape plates! What a beautiful table display! My favorite holiday tradition is dinners with family & friends. This place setting/decor is stunning and the food looks delicious. Breakfast/brunch after present opening is my favorite tradition, too!! I love savoring the moment with immediate family and still knowing there is an entire day of family and food ahead. I would LOVE these Santa dishes! 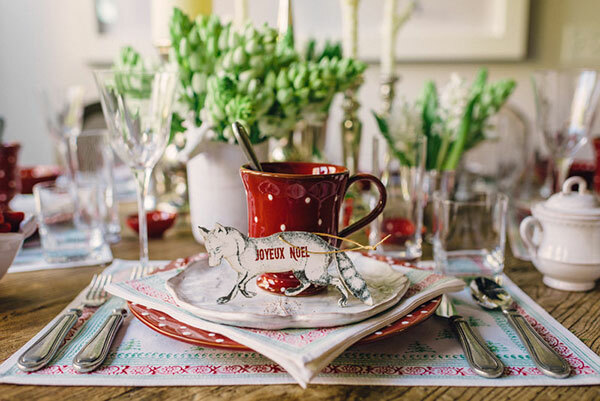 Love, love, love the polka dot place settings. They would also be adorable on Valentine’s Day! awwwweee addy!! I absolutely love these photos. stunning! thank you for hosting this giveaway and thank you vietri for the chance at these gorgeous Santa plates! my favorite tradition is our Christmas eve fondue dinner before presents and church. gifts on Christmas eve is a German tradition. this leaves Christmas morning for Santa! Thanks again and good luck! 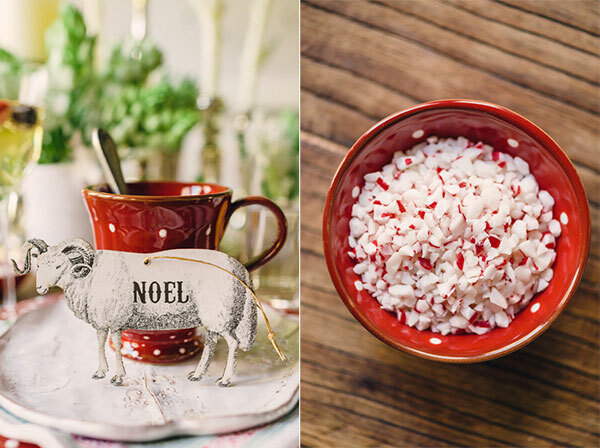 Love these pieces and would love to have them on my table this Christmas. Love this post so much! My favorite holiday tradition is picking out a tree and decorating it– I’m so excited to do so with my husband this year because it’s our first Christmas in our first home! It’s so nice to have your own space to decorate. I can’t wait! 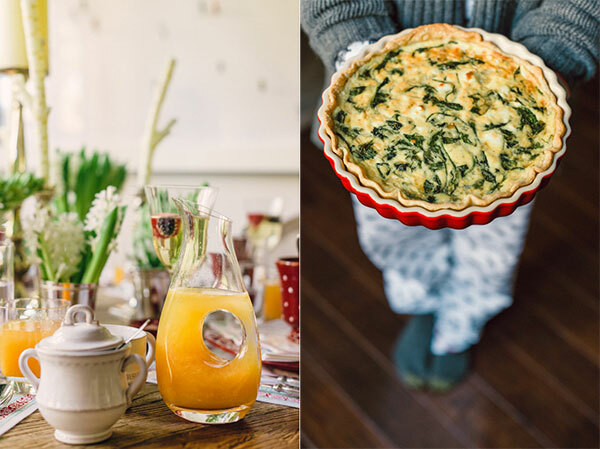 My mother-in-law calls me the Brunch Queen – my favorite meal for entertaining! 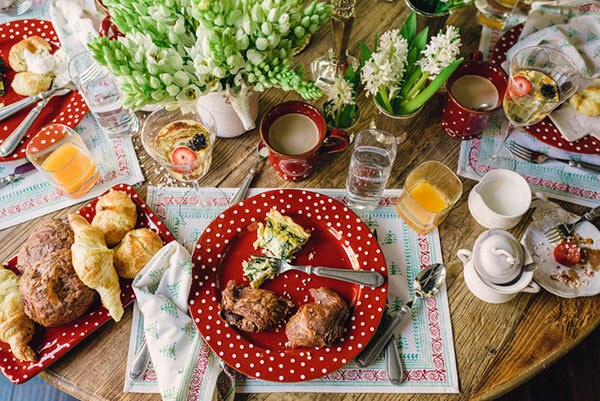 Beautiful dishes set off your lovely tablescape. Where are the animal gift tags/ornaments from? Beautiful table! I’ve been collecting Vietri for years which leads me to my favorite tradition: making a big pot of gumbo on Christmas Eve and serving it to my family in my Vietri Old St. Nick collection! 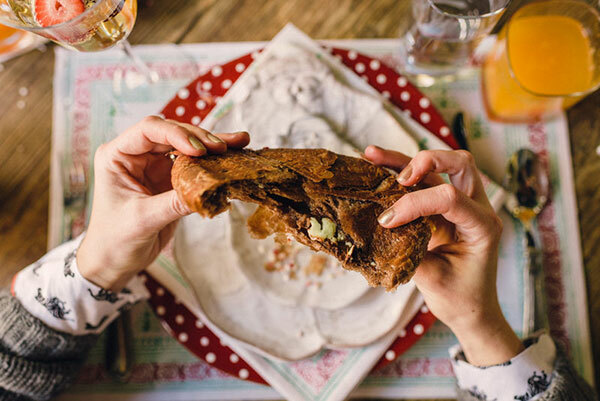 I love a hot cocoa party with your plates filled with cookies. Oh my goodness! 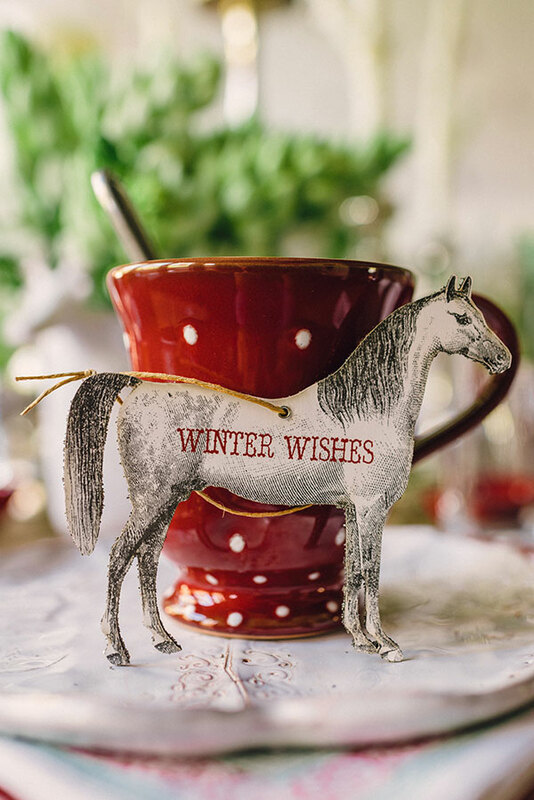 Those are the cutest reindeer serving bowls! Thanks for the post; definitely going on my Christmas list, they match my current dishes well! Favorite Christmas tradition: although my dog passed away last year, my favorite Christmas tradition was letting him open all of the bagged gifts! We’d put treats in ones that weren’t even his just to see him stuff his little head down in through the tissue paper! We have a new puppy now and are hoping he has the same character and excitement Christmas morning! Baking Christmas cookies…lots of them!! This is a beautiful giveaway! Those plates are adorable. waking up on christmas morning at parent’s house. my husband and i still spend the night there with our daughter! beautiful! 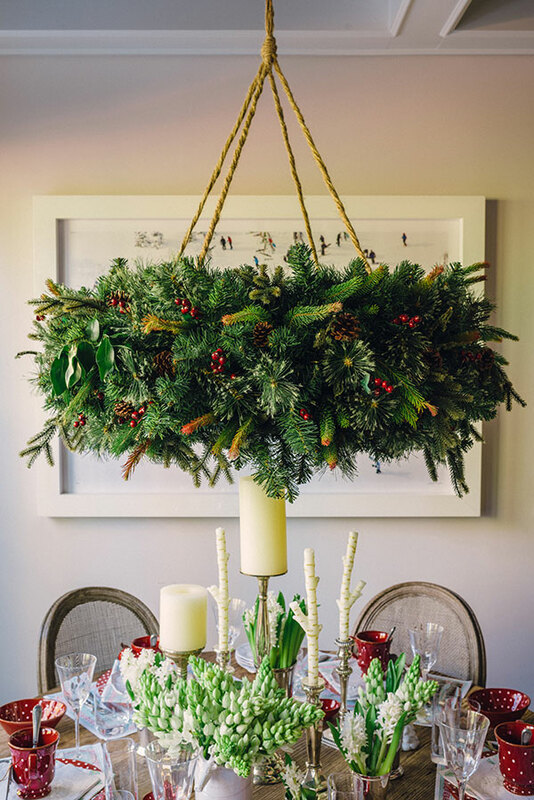 the greenery chandelier is stunning…gorgeous details. My mother just actually wanted to start a new tradition – for Thanksgiving we will always make homemade clam chowder the night before and watch Charlie Brown Thanksgiving and for Christmas Eve we are planning on watching Elf and having a wine and cheese tasting with the family!! 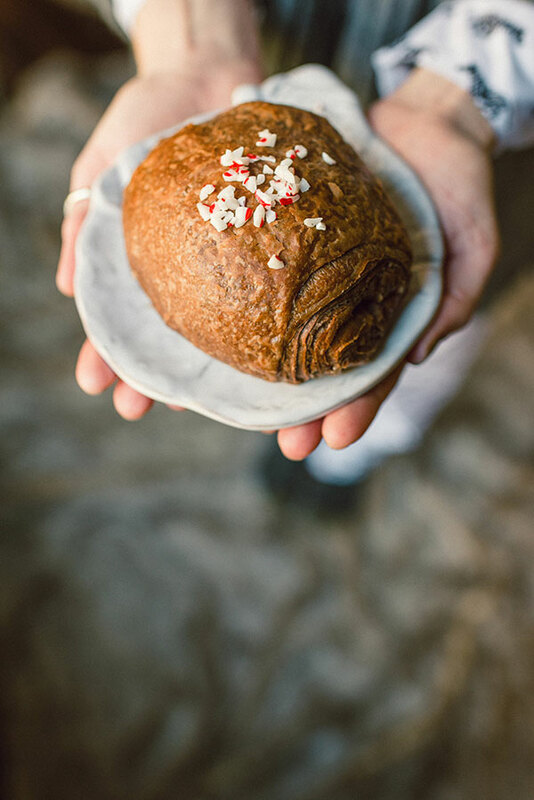 We received Vietri for our wedding and would love some Christmas dishes to use and make memories with as we host Christmas meals! Just came across you blog through Pinterest, excited to start reading! Lovely table! 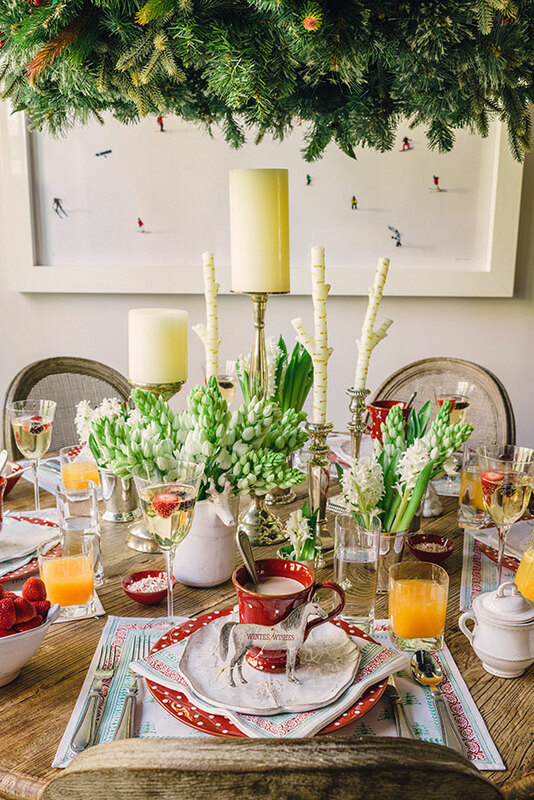 Beautiful photos show off wonderful holiday ware. 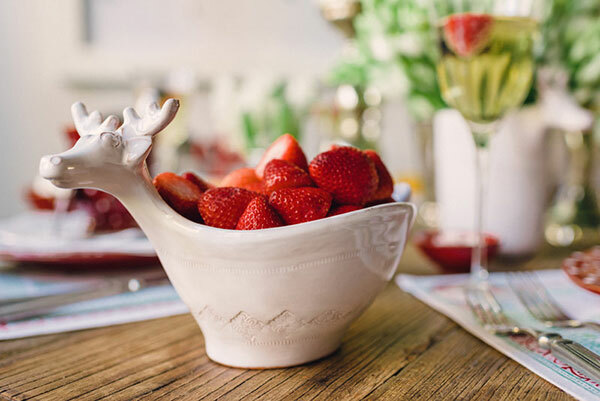 I totally love the reindeer bowl! My favorite tradition is definitely our decoration party right after Thanksgiving when all the family gathers and decorates the tree, and the youngest gets to place the angel! Love the tradition of decorating our tree together! my favorite part about the holidays is definitely re-connecting with old friends!